It's been a while since I did this! Our awesome customers keep posting videos and sending us links to their projects using macetech products. If you made something cool with ShiftBrites or other macetech products, by all means let us know! We'll be tweeting links to new projects we discover, and occasionally make a roundup post like this. Later on we'll make a gallery page for easy navigation to all the cool project examples out there. Submitted by Garrett on Tue, 10/26/2010 - 00:02. 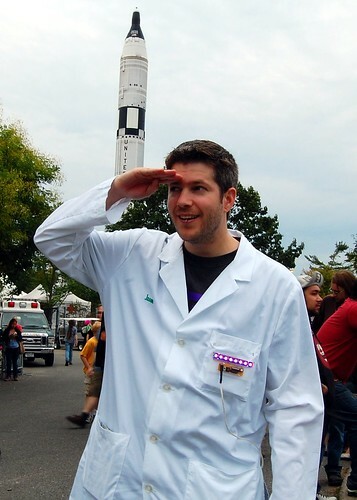 It's been two weeks since the World Maker Faire in New York City, but I did want to write up our pilgrimage sometime. A lot of our work happens on the weekend, so the article's been delayed while we catch up. Jason and I were pretty excited to hear about the new Maker Faire debut in New York. Many of the well-known makers and hackers are located on the east coast, so a New York Maker Faire seems like a smart move. The World's Fair grounds are a perfect venue...San Mateo is pretty nice, but the architecture is nonexistent and there isn't a real rocket looming in the background. Okay, there was a rocket there last year, but it mainly goes to Burning Man, not outer space. We hunted for tickets and landed an awesome deal. Initially Virgin America wanted $860 but a couple days later it was down to $475. Chase somehow read our minds and sent a coupon for a 20% discount on Virgin America if we used the company card. So we got two round trip, nonstop tickets for about $400. The next order of business was to find something cool to bring to the Faire. We were not going to run a booth, so it had to be something small. Wearable electronics! 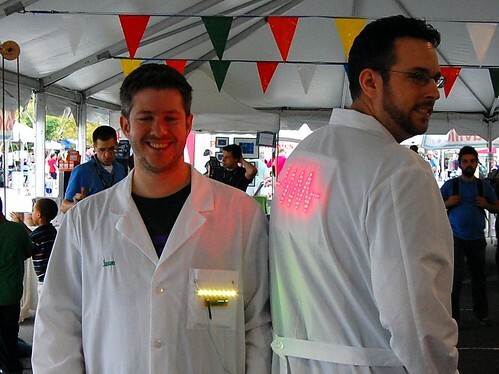 I installed LEDs on our lab coats. Submitted by Garrett on Sun, 10/10/2010 - 22:13. Syyn Labs, a group of artists and engineers known for their large scale interactive sculptures and art installations (including OK GO's music video for "This Too Shall Pass"), participated in the Santa Monica GLOW festival on September 25th, 2010. Their project for GLOW was called the DNA Sequencer and included 512 RGB LEDs arranged in a double helix within a 100-foot-long trellis. Submitted by Garrett on Mon, 10/04/2010 - 01:13. Over the past few years, a lot of small electronics hardware businesses have been starting up. Many of the more successful businesses and projects have adopted "open-source" philosophy into some or all of their products. Open-source concepts have been in existence for a long time...it's human nature to share information and explain how we made something. At the same time, there is what appears to be a conflicting desire to keep processes secret in fear of duplication. The two concepts aren't actually contradictory. When you make and sell something while sharing the recipe, you are dealing in your ability to produce and innovate. A baker can give away a bread recipe while remaining confident in their skill to make the best bread, or come up with even better bread. The idea of keeping this recipe information secret is not a conflict...it marks the point where you are now dealing in intellectual property rather than production skill and innovation. Many companies don't have the ability or desire to build up production skill or innovate fast enough to compete in a market that is working with the same information...so they restrict the information. Submitted by Garrett on Mon, 09/20/2010 - 00:59. 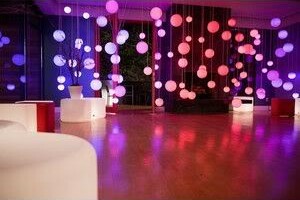 Over 100 glowing globes are scattered midair near the walls of a large room. They smoothly cycle through colors and patterns behind major characters during pivotal plot points. Each globe is brightly lit with an individually controlled 30-bit color. The system is controlled with several Arduino microcontrollers receiving DMX commands. This project nearly overshadows our Olypmic involvement, in terms of worldwide exposure of products we have developed. Unlike the Zygote project we helped Tangible Interaction build for the 2010 Olympic closing ceremony, these globes use macetech products that are available in our store for purchase. Submitted by Garrett on Tue, 06/29/2010 - 21:34. Just a notice to anyone who purchased a Shifty VU Shield in the past few weeks or at Maker Faire: our supplier mixed up some diodes and it's very possible your shield will not work. If you're seeing no response on analog 2 and 3, this is probably why. Please contact us so we can determine if you have a faulty shield, we will repair any with incorrect diodes. Submitted by Garrett on Thu, 06/03/2010 - 11:49. Here's a video of a project nearing completion...uses a bunch of LEDs and it'll be a fun challenge to play. We'll also be one of a select few Makers running a mini-Faire after the Wednesday conference at Google I/O! Submitted by Garrett on Tue, 05/18/2010 - 14:36. The final project we worked on for Tangible Interaction was a redesign and production of a large number of their Zygote interactive LED globe concept. The globes are about six feet across, translucent, filled with helium, and contain LEDs that light the sphere in different colors as they slowly bounce across a crowd. Tangible Interaction has built these before, but they wanted to build a new design from scratch and add several important features. They contacted macetech to work on the design and production of the new Zygote cores. This ended up being a very intense project. We had a solid idea how to proceed at the beginning of the project, but due to worldwide semiconductor shortages, necessary parts were dropping out of stock as fast as they were specified. Every time a part became unavailable, it caused a cascade of design changes that required changing other components, which then became unavailable...and so on. Some parts of the project were completely redesigned several times. Submitted by Garrett on Mon, 03/01/2010 - 12:38. When a city hosts the Olypmics, it's always a reason for that city to put their best foot forward. You'll see amazing architecture and artwork that didn't exist a few years earlier. In recent years both architecture and artwork have been including more light and interactive elements. LED lighting is both efficient and easily controlled to produce a range of color and animation effects. This year we were fortunate to play some part in a number of LED installations at the Vancouver Winter Olympics. In some cases we provided existing macetech products, and in others we developed and produced custom hardware. All the projects were developed and implemented by Tangible Interaction, located in Vancouver, Canada. This was a completely custom project that had a very short leadtime. Alex Beim from Tangible Interaction contacted us about the project idea, and in less than a week they were in production (while working on other projects for Alex and holding down our day jobs). 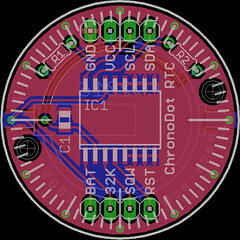 Alex needed a device that would light up an LED with a specific blinking/fading pattern, and also save enough power to run for about two weeks. He needed at least 5,000 of these devices, so the cost also needed to be minimal. Another concern was light weight. Submitted by Garrett on Sat, 02/27/2010 - 19:20. Waaaaaay back in 2009, we took a coffee/side table from IKEA and wired it with 81 ShiftBrite RGB modules in a 9x9 grid. We took it to Maker Faire Bay Area 2009 and showed it off to thousands of people. However, we never managed to put together some detailed documentation, beyond a few photos. Well, we've decided to revisit the project and show a bit more of how the table is constructed, and maybe give you a few ideas for your own LED table project. Additionally, we've added macetech's new Bluetooth shield functionality and hooked it up to Twitter! By correctly formatting your tweet and including the #ledtable hashtag, you can help create an ever-changing work of art in our living room. The numerical and color values must be separated by commas, and each pixel definition must be ended with a semicolon. The #ledtable hashtag can be anywhere in the tweet, and you can define as many pixels as will fit in the tweet. Whitespace and additional text is not a problem. We've just got word that some fans helped set up a tweet generator application for the LED table. Check it out here! Thanks to chicklets921 for creating the generator and MikeCyberMe for setting up the hosting. 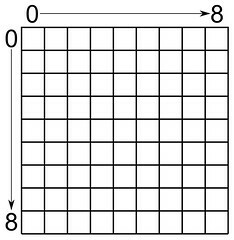 There have been some really cool pictures drawn on the table, but this should help make it a lot easier. Thanks! You can watch the results live on UStream below (if we have the table running at the moment). Unless you want to go to Ustream's page, just click on the little ">" arrow in the lower left corner instead of the big one in the middle of the video. Submitted by Garrett on Tue, 02/23/2010 - 00:01.